I studied those photos so much that I became those people in my mind, noticing every detail of their facial expressions, contact that they had with the land, objects or people among them. I was entranced, and I still often retreat to this cherished book. Many people neglect to take their children to museums these days. Or if they do, many simply walk through the exhibits without talking about what emotional response the artwork brings, or taking enough time to absorb any one piece—and many families don’t even display more than a poster or two up in their homes or own a book presenting an artist’s work. This breaks my heart, and so—I decided to host an art appreciation lesson for my daughter’s first grade class. I brought five paintings that I owned and shared one after the other with the students. I saved a special one for the end. 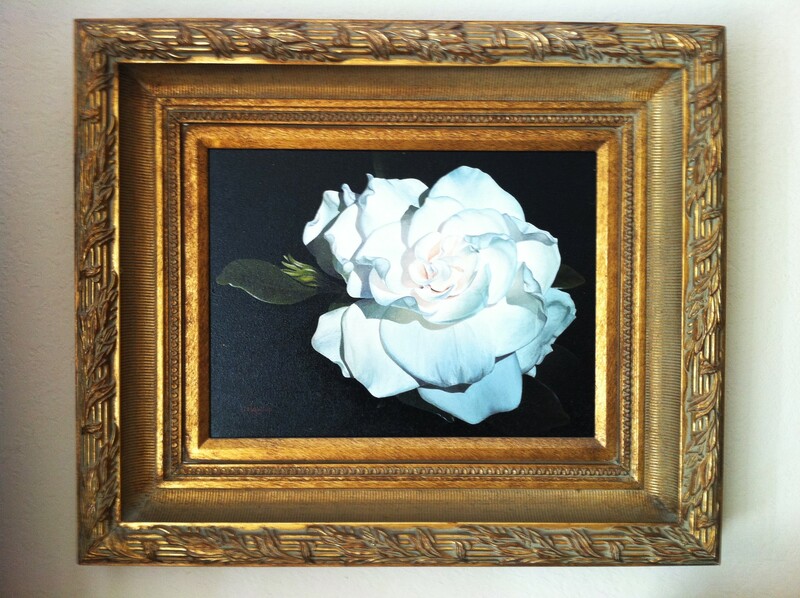 It is one of my favorite paintings, entitled “Laura’s Gardenia” that was painted by my good friend from a photo that was taken of a gardenia on my patio by my step-father. Each child knew the answer immediately and all of their hands flew up at once—I called on the first little boy who eagerly raised his hand. “It’s white!” he exclaimed. I then asked him to look closer and see if he could find any other colors in the flower. “Oh, now I see some yellow”, he replied. This led to a beautiful time of meditative self discovery with the class of children. Just as I had done on my own many times before, we became lost in the painting and its never-ending details. We explored the warm peaches and gentle yellows in the center of the flower. We discovered the gentle folds of the petals that caused shadows to fall in cool grays and blues upon the blossom. There were hidden hues of purple along the petal’s wavy curves. We followed the edges of the leaves and petals and marveled in their splendid windings. We talked about how the different colors and features made us feel and about which of our senses was stirred when we looked carefully and long enough. There was appreciation for being able to quiet ourselves enough to see all of the different facets of the flower. We even noticed the light being emitted from the painting. Each brushstroke was intentional and we were grateful for this. We also contemplated being grateful for the details that we couldn’t find that day. I was very moved by the time I spent with the children on that special day. I could see their lights shining upon the painting and was awash with joy. We each found a place in our hearts that rang true when we became collectively awarethat day— our light, and the light that shined through us was burning bright like a beacon on a foggy day. I believe that we can all become more thoughtful through appreciation of the arts, and it is bound to rub off in other areas of our lives because oftentimes, a little awareness can magically lead to more. We can meditate on a poem or a painting. We can see the aspects of the arts that stir our senses. We can uncover what those senses and feelings are if we just let our light shine through us long enough to notice the details that surround us. We might even find all of the colors of a beautiful sunset in a single white flower that awakens more than only one of our senses. The following is a poem that I was inspired to write based upon the beautiful painting that I wrote of above. Photos of paintings by Diana Pace. You can find more of her gorgeous work here. This entry was posted in art, beauty, mindfulnes, poetry and tagged #beautiful, #DianaPace, #photography, art, artist, education, poem, poetry by laurakutney. Bookmark the permalink.